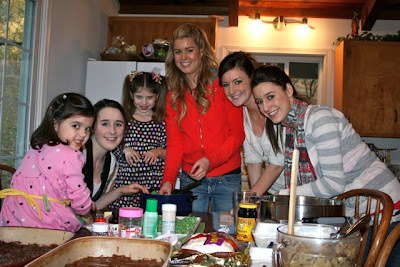 Yesterday four of my five sisters came over to bake cookies with the girls and I. It did end up being much more work than I thought it would be, but it is so rare that we are all able to get together, and it will be so nice to have all these goodies to take to my parents home tomorrow for Christmas, as well as for all the company we have arriving on Sunday! 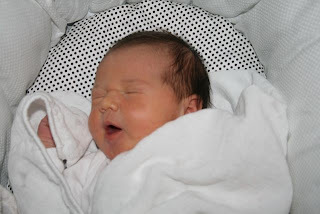 (Our little Rose will be baptized this coming Monday!) I sure wish my sister Jamie could have been here... (Could you all please say a prayer for her father-in-law who was just hospitalized, and then moved home to be with his family, due to complications with his lung cancer.) We miss you Jamie! 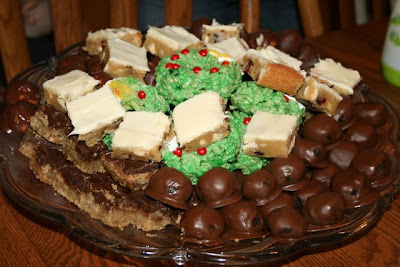 We started out WAY too ambitiously with a huge stack of recipes we were hoping to make, but ended up shortening our list to just Cranberry White Chocolate Bars (using a mix from Costco), Oreo Truffles, more Rice Krispies Treats Wreaths, Pecan Turtle Bars, Cranberry Orange Cookies, and Chocolate Coconut Balls. I also have the dough in my fridge for Sugar Cookies for my children to cut out and decorate sometime soon. Twinkle Toes and Chiquita really enjoyed spending time with their aunts, licking spoons, and helping out whenever they could! The boys on the other hand went ice skating with their daddy and my youngest brother, and Rose spent the day sleeping, nursing, looking cute in her little t-shirt from Aunt Meagan, and being just as sweet as ever! 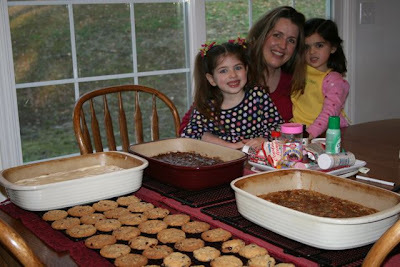 Despite thinking it would be "easy" to have everyone over to bake (in my tiny kitchen!) I was pretty overwhelmed tired by the end of the day. Thankfully a dear friend dropped off dinner, hubby washed dishes, and my mom stopped by on her way home from shopping to force me to sit down while she finished cleaning up! Today will be much more relaxed, though I can't believe it is already Christmas Eve! Advent sure did fly by, didn't it?! Christmas is almost here! Jessica, it looks like you have great support in your family and friends but don't over do! Let others take care of you, so you can regain your strength and keep up a good milk supply! I am an over-achiever myself, so I know what I am talking about! ;-) Your baby girl is precious (just like her siblings)! You are blessed to have such a wonderful family. You have a very beautiful family and I love reading your blog. My daughter was baptized on the 28th as well. Merry Christmas and all the best wishes to your family. Looks like you are busy with lots of yummys. Everything looks so tempting.